Today I introduce you to a very popular homemade Japanese dish: “Pan-Fried Udon Noodles,” which is called “Yaki-Udon” in Japanese. The ingredients are cooked Udon noodles, sautéed vegetables and turkey sausage seasoned with soy sauce. It is good for a quick meal because you can get carb, protein and vitamins from one dish. And it is very delicious!! The recipe is very simple and quick. If you sometimes cook pasta dishes in your house, the cooking process will be familiar to you. Sauté turkey sausage and vegetables. You can use any vegetables and meats. And also you can cut the ingredients however you want. If you like to eat chunky vegetables, you can cut into big pieces. if you or your family don’t like vegetables very much, you can mince well and stir in as a seasoning on the Udon noodles. Categories: Noodle, Udon | Tags: beauty, blog, Cabbage, carbohydrate, cooking, Delicious, Easy, fitness, Food, Food blog, fusion food, Green bell pepper, Healthy, Homemade, Japan, Nutrition, Onion, protein, quick dinner, quick lunch, quick recipe, recipe, Recipes, Shiitake, turkey sausage, Vegetable, Vitamins | Permalink. Today I introduce you to Japanese traditional side dish which is called “U no Hana”. This is cooked Okara with braised vegetables. Okara is a by-product of making tofu so it is high in protein, fiber, vitamins and Calcium. This dish is a very popular side dish in my family’s meal because it is healthy, delicious and inexpensive (in Japan). Here is Dry Okara I used in this recipe. Japanese use Okara for many recipes as a meat substitute to make the dish extremely healthy and to increase the amount of food in the dish. For example, we add Okara or we substitute it for the meat when we mix meat balls, hamburger steak,…etc. See the last post Delicious Vegetarian Pan Fried Nuggets using Okara substitution for meat. In this recipe I used okra, carrot, shiitake mushroom and green onion. You can use any vegetables in your refrigerator. If you can get dried shiitake mushroom instead of fresh ones, the dish will be more flavorful and nutritious. You can just soak shiitake mushrooms in water the day before you cook. This time I used kelp Dashi stock so for those who stick to a vegan diet this is a vegan dish. You can use any kind of Dashi stock you have. Here is a tip: “How to store cut green onion.” We often use cut green onion in many Japanese dishes. I always keep cut green onion in my freezer. Cut washed green onions and dry on paper towels. Put in a freezer bag and freeze in freezer. Use within 1 month. Simmer all vegetables with Dashi stock and seasonings. Cook soaked Okara and stir with braised vegetables. Categories: Okara, Simmered, Vegetables | Tags: beta-carotene, Calcium, Carrot, Delicious, fiber, green onion, Healthy, Homemade, Japan, kelp dashi stock, Low calorie, Low fat, Nutrition, okra, protein, recipe, Shiitake, side dish, soy sauce, Traditional, vegan, Vegetable, Vegetarian, Vitamins | Permalink. Today I introduce you to Japanese traditional dish “Braised Taro”. It is a very easy, simple and delicious side dish. My mother always cooked 5 small dishes for each member of our family for every dinner. The 5 dishes idea comes from “Ichijiru-Sansai” which means basic meals should consist of one bowl of cooked rice, one kind of soup and three vegetable or fish side dishes. This dish is great as a side dish in a Japanese meal. In addition, we say “Hara-Hachibu” which means eat until you feel your 80% full, don’t eat until you are too full. This is a Japanese traditional eating rule for being healthy so my mother always prepared small dishes for each of us. The recipe is easy. Just simmer taros in Dashi stock. I used “Kelp Dashi Stock,” but you can use any kind of stock. The dish is mainly seasoned with soy sauce and the taros become so tender that they absorb the Dashi well so it is very delicious and it is great for vegetarians if you use vegetable stock. Also, it is an oil-free dish so it is very healthy. When I introduce you cooking Japanese dishes I always try to show you the easiest way to cook these dishes even if you have no experience with cooking Japanese food. For example, in this recipe, I simmered peeled taros in Dashi stock. But usually taro requires extra preparation time for to simmer more easily and make a great final presentation. But in this recipe there is no need to do the extra preparation because even without it this dish is very delicious and looks great. I want everybody to try to cook Japanese dishes in a lighthearted and fun manner so we do not need to make these recipes hard in order to enjoy all the taste, health benefits, and beauty of traditional Japanese dishes. You can buy taros in many grocery stores in the US and in all Asian markets. The tip for picking a good taro is that the taro should have ball shape, and be a little bigger than a golf ball. This shape and size makes for a good and delicious taro. Enjoy this delicious, healthy, and nutritious dish. I hope you like it. Categories: Braised, side dish, Taro | Tags: braised, dashi stock, Delicious, Easy, gluten free, Healthy, Homemade, Japan, Low calorie, Nutrition, recipe, soy sauce, Taro, Traditional, vegan, Vegetable, Vegetarian, Vitamins | Permalink. Today I introduce you to my mother’s “Homemade Pot-au-feu” recipe. 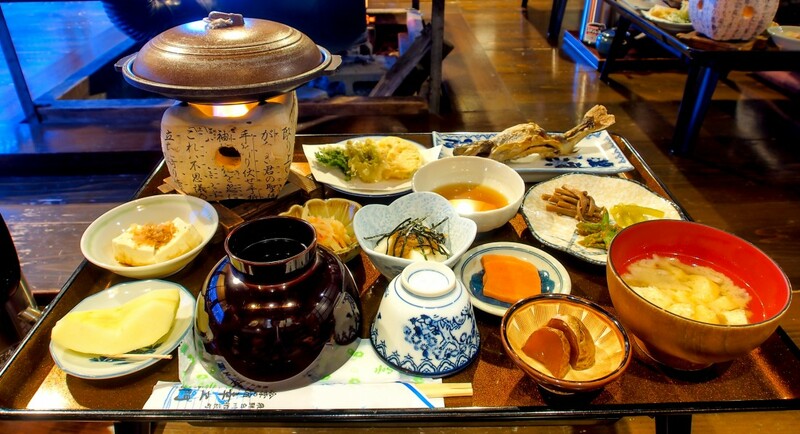 In Japan, we often cook “Pot-au-feu” because it is very easy and fuss-free. Just cut your favorite vegetables and meat, and simmer in broth. The point is to cut ingredients in large sizes. The dish is simmered for about 40 minutes total so the ingredients are very tender and can be eaten easily. In addition, the soup contains the ingredients’ juices, which means the dish is very nutritious. The only seasonings are salt and pepper so you can enjoy the delicious natural taste of the ingredients. I used cabbage, onion, potato, carrot, turkey sausage and Daikon radish. You can use any kind of vegetables and meats. We usually cook this dish in colder seasons so I recommend that you use root vegetables because they are usually in season when it is cold. Eating seasonal food makes us healthy because our body can adjust to the weather for each seasons. Enjoy very delicious and nutritious homemade Pot-au-feu! Categories: soup, Vegetables | Tags: beta-carotene, Cabbage, Carrot, chicken bouillon cube, Daikon radish, Delicious, Digestion, Easy, fuss-free, Healthy, Homemade, Nutrition, Onion, Potato, protein, recipe, root vegetable, sausage, tender, Vegetable, Vitamins | Permalink.